Charlton Athletic moved out of the Championship's bottom three as they played out a goalless draw with Leeds United at the Valley. Ademola Lookman's shot bounced along the line for the hosts, while Marco Silvestri's stunning save denied Ricardo Vaz Te when clean through. Leeds created little, but Tom Adeyemi missed a late sitter from six yards. The Whites have now picked up 10 points in six matches under new boss Steve Evans, but slipped to 18th. Charlton fans again protested against the club's owners before the game, but were almost celebrating when Lookman went agonisingly close, with Johann Berg Gudmundsson inches away from forcing it home. Lookman then produced a powerful low drive to test Silvestri as Charlton continued their confident start. Leeds took 20 minutes to trouble Stephen Henderson, who dealt easily with Alex Mowatt's free-kick before Lewis Cook curled a shot wide. Silvestri again denied Lookman and then pulled off a superb low save to deny Vaz Te, who connected well with Gudmundsson's cross from eight yards. United offered little in attack until late on when Mowatt volleyed over and Charlie Taylor's low shot forced Henderson into a good stop. The Addicks survived the flurry of chances to end a three-match losing run and move up to 21st. "We learned our lesson from Ipswich and Brighton, and we defended like men. We were the better team in the first half and we had a good chance to get ahead and maybe win 1-0. "Leeds showed quality and had a good 15 minutes and we were lucky not to concede when they had their best chance, but we deserved that. "We had chances and one day they will flow in. Another day we could shoot from 18 yards." "I was delighted with my lads. "I told them in the dressing room to look how the Leeds fans applauded them at the end. "The difference between now and when we lost at QPR (1-0 two weeks ago) was incredible. The fans are behind them now because they played for the shirt, played for the badge - that's what the fans want. "If we had left The Valley without a point then the Charlton players and staff should go home wearing balaclavas because it would have been a robbery." Match ends, Charlton Athletic 0, Leeds United 0. Second Half ends, Charlton Athletic 0, Leeds United 0. Corner, Leeds United. Conceded by Tareiq Holmes-Dennis. Giuseppe Bellusci (Leeds United) wins a free kick in the defensive half. Attempt saved. Alou Diarra (Charlton Athletic) header from the left side of the box is saved in the centre of the goal. Assisted by Johann Berg Gudmundsson. Substitution, Leeds United. Sam Byram replaces Gaetano Berardi because of an injury. Delay in match Gaetano Berardi (Leeds United) because of an injury. Liam Bridcutt (Leeds United) wins a free kick in the defensive half. Attempt missed. Gaetano Berardi (Leeds United) right footed shot from the centre of the box is too high. Assisted by Tom Adeyemi with a headed pass. Substitution, Charlton Athletic. Karlan Ahearne-Grant replaces Ricardo Vaz Te. Attempt blocked. Tom Adeyemi (Leeds United) right footed shot from outside the box is blocked. Attempt blocked. Liam Cooper (Leeds United) left footed shot from outside the box is blocked. Assisted by Jordan Botaka. Attempt blocked. Ademola Lookman (Charlton Athletic) right footed shot from outside the box is blocked. Assisted by El-Hadji Ba. Offside, Leeds United. Giuseppe Bellusci tries a through ball, but Chris Wood is caught offside. Attempt blocked. Charlie Taylor (Leeds United) left footed shot from outside the box is blocked. Corner, Leeds United. Conceded by Stephen Henderson. Attempt saved. Tom Adeyemi (Leeds United) left footed shot from the centre of the box is saved in the bottom right corner. Assisted by Charlie Taylor with a headed pass. Substitution, Charlton Athletic. El-Hadji Ba replaces Reza Ghoochannejhad. Substitution, Charlton Athletic. Simon Makienok replaces Johnnie Jackson. Attempt blocked. Stuart Dallas (Leeds United) right footed shot from the right side of the box is blocked. Assisted by Chris Wood. Tom Adeyemi (Leeds United) hits the right post with a right footed shot from the centre of the box. Assisted by Jordan Botaka. Tom Adeyemi (Leeds United) wins a free kick in the attacking half. Attempt missed. Lewis Cook (Leeds United) right footed shot from the centre of the box misses to the right. Assisted by Stuart Dallas. Attempt missed. Tom Adeyemi (Leeds United) left footed shot from the centre of the box misses to the left. Assisted by Lewis Cook with a cross. Liam Bridcutt (Leeds United) wins a free kick in the attacking half. Attempt saved. 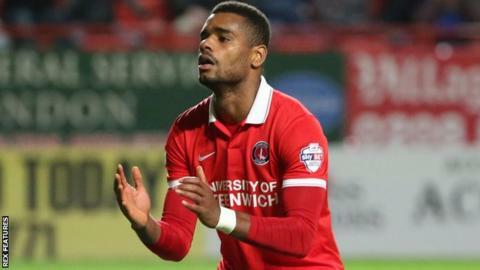 Ricardo Vaz Te (Charlton Athletic) right footed shot from outside the box is saved in the bottom left corner. Ademola Lookman (Charlton Athletic) wins a free kick in the attacking half.